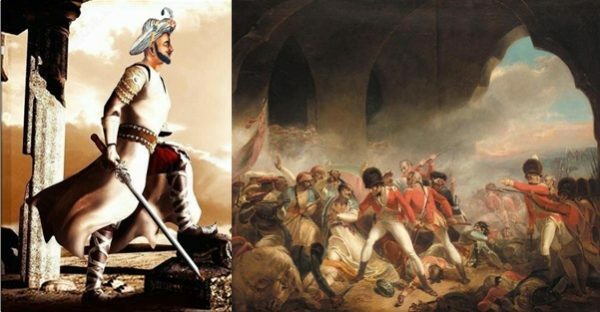 A cross-section of the new generation of historians and novelists is of the opinion that all the available documents and history books on Tipu Sultan originate from the British and, therefore, they cannot be relied upon, the ostensible policy of the British being to ‘divide and rule’. Pointing to the correspondence between Shrimad Paramahamsa Parivrajakacharya Shri Sankaracharya of Sringeri Mutt and Tipu Sultan during 1791-92 and 1798, they argue that Tipu was an apostle of secularism and as such respected Hindu religious heads and places of worship. 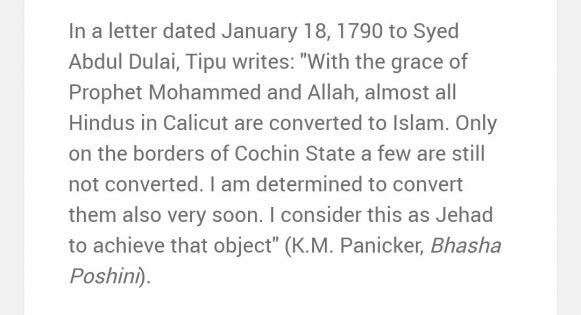 Tipu is also identified as among the first nationalists who fought against the British to liberate the country. 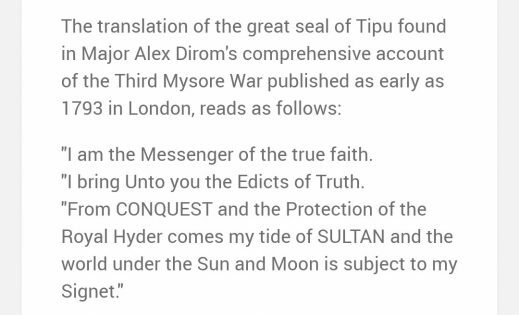 However, the arguments fall apart if one goes through various letters and edicts issued by Tipu Sultan to various public functionaries, including his principal military commanders, the governors of forts and provinces, and diplomatic and commercial agents. “Don’t you know I have achieved a great victory recently in Malabar and over four lakh Hindus were converted to Islam? I am determined to march against that cursed ‘Raman Nair’ very soon (reference is to Rama Varma Raja of Travancore State who was popularly known as Dharma Raja). Since I am overjoyed at the prospect of converting him and his subjects to Islam, I have happily abandoned the idea of going back to Srirangapatanam now” (K.M. Panicker, Bhasha Poshini, August, 1923). “Your two letters, with the enclosed memorandums of the Naimar (or Nair) captives, have been received. 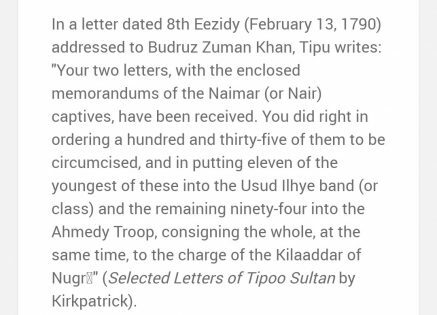 You did right in ordering a hundred and thirty-five of them to be circumcised, and in putting eleven of the youngest of these into the Usud Ilhye band (or class) and the remaining ninety-four into the Ahmedy Troop, consigning the whole, at the same time, to the charge of the Kilaaddar of Nugr…” (Selected Letters of Tipoo Sultan by Kirkpatrick). “With the grace of Prophet Mohammed and Allah, almost all Hindus in Calicut are converted to Islam. Only on the borders of Cochin State a few are still not converted. I am determined to convert them also very soon. I consider this as Jehad to achieve that object” (K.M. Panicker, Bhasha Poshini). “I am the Messenger of the true faith. “I bring Unto you the Edicts of Truth. The letters and the seal speak volumes of the mind of the man who wantonly roamed and terrorised South India and the southeastern borders of Maharashtra for a decade. “Since I manifested my friendship in writing to you, my messengers have arrived with the following intelligence which will not be displeasing to you. 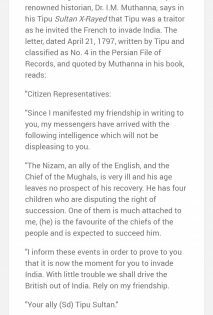 “The Nizam, an ally of the English, and the Chief of the Mughals, is very ill and his age leaves no prospect of his recovery. He has four children who are disputing the right of succession. One of them is much attached to me, (he) is the favourite of the chiefs of the people and is expected to succeed him. “I inform these events in order to prove to you that it is now the moment for you to invade India. With little trouble we shall drive the British out of India. Rely on my friendship. That was Tipu’s expression of love for India! Featured image (representation) courtesy: Pinterest and readoo.in (Readoo India).